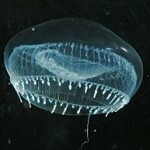 Who would have known that a little glowing jellyfish would come to mean so much? 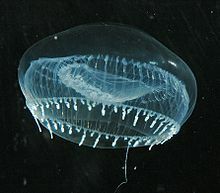 In the 60’s and 70’s a Japanese scientist named Osamu Shimomura isolated a protein from the pacific jellyfish (Aequorea Victoria) that allowed the jellyfish to glow. This cylinder-shaped protein is now called Green Fluorescent Protein or “GFP.” Shimomura also uncovered the part of the GFP molecule that was responsible for its fluorescence. After this initial discovery, other researchers began to show an interest in the little glowing molecule, especially, Martin Chalfie and Roger Tsien. Martin Chalfie began attaching GFP to gene promoters, hoping that GFP would be produced whenever the gene was activated. After successful experiments, his group published a paper in Sciencein 1994. During this time, scientist Roger Tsien wanted to better understand how GFP worked. So his team cloned, mutated and picked at the protein’s DNA and discovered that they could create new colors! These three scientists won the Nobel Prize for their achievements in 2008. The discovery and development of GFP has been an essential driving force for genetic engineering and has brought this technology to new levels of complexity in the 21st century. Today, making domestic animals glow or lighting up neurons with many fluorescent colors (this project is called “Brainbow”) is almost “standard operating procedure.” This has revolutionized many aspects of research, especially regarding disease. 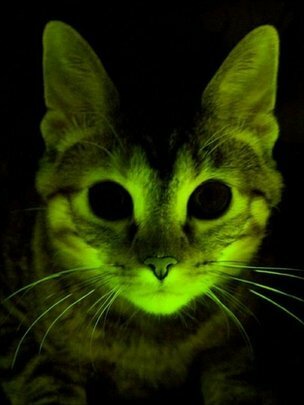 Recently, they have decided to produce GFP felines, or cats that “glow in the dark.” Although these cats might make interesting house-mates, the purpose was to create animals with specific disease resistance. Occasionally cats suffer from a virus called the Feline Immunodeficiency virus (FIV). It is a virus that resembles HIV (Human Immunodeficiency Virus), but is not always fatal in cats. An antiviral gene that produces a protein that can block the AIDS virus was discovered in a rhesus macaque. This gene was found to work in other animals as well. This is very exciting, but how would you know that it is actually working? Is the cat’s immune system really producing the antibodies? 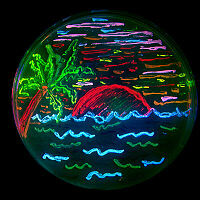 To answer this question, scientists decided to use GFP as a marker. They attached the GFP DNA sequence to the gene that makes the FIV antibodies. Every time an antibody is produced, GFP proteins are made as well. 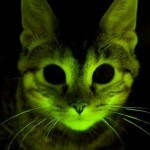 Therefore, cats producing the genetically engineered antibodies for FIV would also fluoresce under UV light. In other words, a glowing green cat indicates FIV resistance. This may seem like a breakthrough only for feline health, but scientists are hoping this will give us insight into fighting the human version as well. Print article This entry was posted by Elna Carrasco on October 5, 2011 at 5:54 pm, and is filed under DNA Interactive. Follow any responses to this post through RSS 2.0. You can leave a response or trackback from your own site.